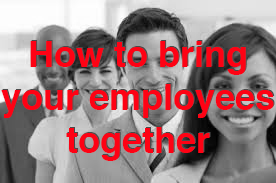 Q: How can you bring your employees closer? Find a subject that makes everyone realize they need to LEARN, not teach, dictate or lead. Work together to discover information about that topic. In addition to being fun, it may have surprising effects over time in creative brainstorming, strategy and customer relations, while bringing your team closer together. Science says smiling at someone makes you more approachable. Smiling, laughing and finding common humor provides our team endless hours of entertainment and ongoing office jokes. Whether it is sending each other Someecards or links to the popular Tumblr, #whatshouldwecallme, our office finds ways to make each other laugh and ultimately build a better, more collaborative atmosphere. Last summer, we put together four relay teams and participated in a sprint triathlon (a few spouses and kids joined in, too). Even the people who didn’t participate in the event came to watch everyone else, and it was a great team-building outing. We were competitive — in a friendly way, of course — but also cheering each other on. We’ll definitely do another one this summer. The team needs to have fun outside of the office. This makes the people on your team get closer, and it ultimately makes them want to work even harder. Particularly in a startup environment, everyone needs to feel like they’re in it together and want the whole team to succeed. Karaoke is a unique mix of fun and embarrassment. But dinners, drinks and movies don’t hurt, either. We have a committee of about eight employees from different departments that plan regular events for our whole office. We’ve given them a generous budget, and they plan monthly birthday parties, special food treats (green shakes for a St. Paddy’s Day), happy hours and more. Since they are employees, they also have a great pulse on what other employees would enjoy. Members rotate quarterly. One way to bring a team of co-workers together is by literally creating a team. Whether it’s dodgeball or softball, it’s great to have something that everyone looks forward to at the end of the day. Drinks after a game certainly don’t’t hurt, either. Every team I work with, in the early days, will go on a retreat together. It may feel weird or irresponsible to spend money on paying for a team vacation, but it’s worth every penny. Startups are a battle, and you need to know your fellow warriors. Cook together, clean together, go skiing or play soccer. Whatever it is, hang out and get comfortable with each other. We host regular happy hours and outings to keep our team refreshed and connected. Twice a month, we budget $100 to $200 for half-price happy hour appetizers or even just a pizza party. When you’re busy grinding, it can be difficult to justify an hour of fun — but it’s completely worth it. Your team will be more cohesive and ready to get stuff done. We have a kegerator in our kitchen. Besides the fact that this encourages a social environment, most conflicts are easily resolved over a beer and an honest conversation.